This intensive course starts in September 2019 and will be completed in July and is delivered over two full days per week, Thursdays and Fridays. You are also required to spend one day in placement. You can achieve Level 3 credits validated by CAVA, which is a ‘kite marked’ accreditation body. 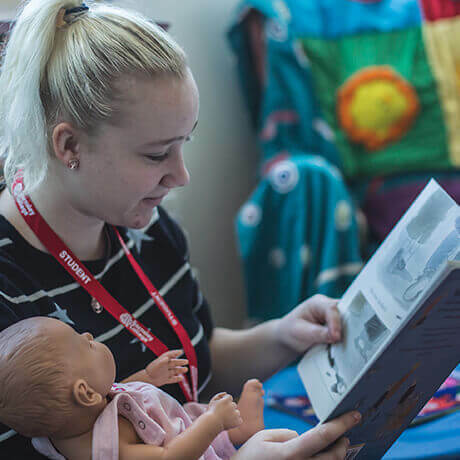 To achieve the Access to HE Childcare, you must achieve an agreed number of credits which is currently 60. 45 of these credits are at Level 3 (graded) and 15 are at Level 2 or Level 3 ungraded. This course is excellent preparation for those who wish to train to be teachers or who want to study early years related courses at university. The course is especially designed for mature students who wish to study at university in the future but do not currently have the necessary academic qualifications to apply (always check directly with the university you wish to study at before you apply to us to ascertain whether this access course is the correct one). You will be expected to carry out a substantial amount of self-study in your own time. A mixture of study methods are employed on both programmes, e.g. lectures, group workshops and discussions to stimulate your interest and enhance your learning. You will be continually assessed on this programme through a wide variety of course work, e.g. an essay, a report, a presentation and/or group work. Although there is no formal examination, an end of module test is used to collect some evidence needed for assessment. You will require stationery items. On completion of this programme, you could apply for training in a career such as BA (Hons) in Early Years or foundation degree in Learning Support. Students wishing to apply to university are advised to contact the relevant admissions tutor with regard to the level of English and maths required for entry. Likewise students should check that the course is acceptable as an entry qualification for the degree programme they wish to enter. This course may be eligible for an Advanced Learner Loan. Contact our friendly Information Team on +44 (0)1226 216 123 or email info@barnsley.ac.uk. about eligibility and how to apply. You can also visit the Advanced Learner Loan page.